Missed out on making millions with Bitcoin (what’s Bitcoin, you ask)? Don’t worry – you’ve still got time to jump in on alternative cryptocurrencies, like Litecoin and Feathercoin. Thanks to a different algorithm at the core, those can still be mined by anyone with a graphics card – expensive ASIC Bitcoin miners won’t work. What are you waiting for?! Kannon published a tutorial back in July about getting started with Litecoin Missed Out On The Bitcoin Gold Rush? Get In On The Litecoin Silver Rush Instead Missed Out On The Bitcoin Gold Rush? Get In On The Litecoin Silver Rush Instead If you missed the Bitcoin mining craze and still want to get in on pick-axing a virtual currency, you’re in luck! In 2011 Litecoin established itself as a major player within the world of electronic... Read More , but the software tools have improved since then, so I thought it would be worth publishing an update. One point to note is that at the time of Kannon’s article, Litecoins were worth less than $3, they’ve now increased to 10 times that value and are significantly more difficult to mine. If you were paying attention, unlike me, then congratulations on your newly acquired fortune – hold onto them! Disclaimer: There are a lot of alternative cryptocurrencies out there, some of which are attempts to get rich quick by the coin’s creator. I’m suggesting Litecoin because it’s the next largest cryptocurrency that’s still possible to mine, but obviously I can’t guarantee the whole cryptocurrency bubble won’t be a complete failure and be banned in every country in a few years. That’s exactly what stopped me mining Bitcoins two years ago now, a decision I clearly regret. Worst case scenario, you’re investing in a nice gaming machine. If you’re willing to take a gamble on other cryptocurrencies, check CoinWarz for an up-to-date profitability list and limit your search to “Scrypt”-based currencies – those can all still be mined using graphics cards. First, you’re going to need a good graphics card. It is possible to mine using a CPU, but it’s so ridiculously slow it’s just not worth it, even with a top-of-the-range CPU. ASICs designed for Bitcoin mining are also ineffective due to the different algorithm used to mine Litecoins. That’s the thing about ASICs – they’re really good at one dedicated task and useless at anything else. AMD Radeon cards (like this XFX AMD Radeon HD 7750) are overwhelmingly better than equivalently priced NVIDIA cards due to the different architecture (more, slower processors; as opposed to fewer, faster processors), as well as a particular math operation that can be done in one cycle on AMD but requires 3 cycles on NVIDIA cards. Remember, we’re not talking about gaming there, so this certainly doesn’t mean AMD cards are better than NVIDIA at gaming performance; purely in terms of the math required to mine crypto currencies. Of course, running a high-end graphics card on full load 24/7 requires a lot of power; so much, in fact that unless your graphics card produces more than a certain rate of kilohashes per second, you’ll be making a net loss due to power costs (unless your power is free, in which case, have at it with anything you’ve got). Therefore, it’s important you either invest in a new card, or accurately check what your current card is capable of. 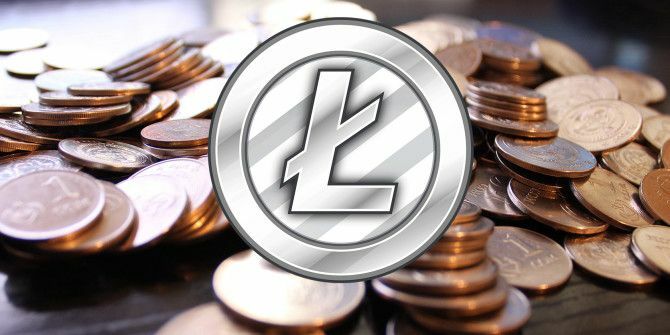 The easiest way is to check the Litecoin mining hardware comparison chart [No longer available] and see if your card is listed – take the lowest figure there as a realistic estimate of what you can achieve easily, which will give your calculation a little room for error and allow for idling time due to network issues, etc. Plug that number into this calculation tool, along with an estimate of power consumption and power costs for your area; and out will come an idea of how much “profit” you’ll be making – but bear in mind the difficulty will increase rapidly. For a more realistic approach to Return-On-Investment rather than daily profit, check out this Reddit thread. At this point, it may be painfully obvious that you may even end up making a net loss with your current setup. For this reason, I invested in a new graphics card, a top of the line AMD Sapphire Radeon R9 290. It hits a sweet spot between power consumption, and production rate, even though the purchase cost is quite high. It’s not just the graphics card, of course – the new card required more power than my 350 watt PSU could provide, so that’s another $100 for a new PSU. You could mine solo, but it’s harder, more work to set up, and the rewards aren’t as reliable. Joining a pool means you get paid for all the work do you, whether or not you actually find a block; it’s like a lottery syndicate. Check out the current list of mining pools [No longer available] here. Once you’ve joined a pool, you should find somewhere to “manage workers”. From that page, you’ll find a worker name and password (leave it as x, you don’t need one), and there should be a list of that pools servers somewhere too. Note these all down. The mining scripts are available for Windows as Kannon described before Missed Out On The Bitcoin Gold Rush? Get In On The Litecoin Silver Rush Instead Missed Out On The Bitcoin Gold Rush? Get In On The Litecoin Silver Rush Instead If you missed the Bitcoin mining craze and still want to get in on pick-axing a virtual currency, you’re in luck! In 2011 Litecoin established itself as a major player within the world of electronic... Read More , but I experienced so many driver problems and variations in performance that it just wasn’t worth the trouble. 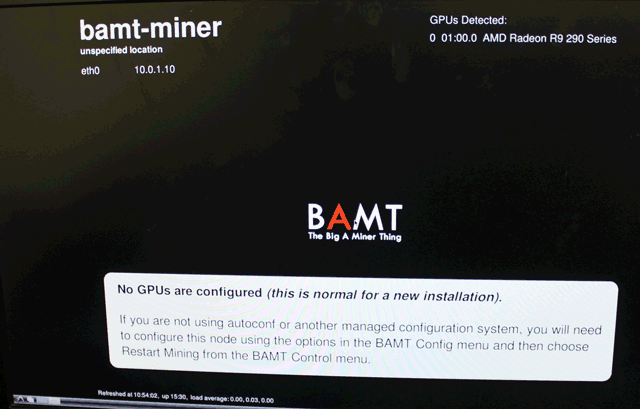 BAMT is a 2 GB linux distro that boots off USB – it’s dedicate to the task of mining, and it does it well. Why mess around? After two days of thinking I had a dud card — mining would work for a few minutes then any tweaks would kill it and require a complete re-install of Windows (yes, seriously) — I was up and running with a BAMT Live USB in 10 minutes. Seriously, don’t use Windows. At the time of writing, the latest Litecoin enabled BAMT is version 1.2 and it works fine with my R9 290 graphics card, with no driver updates. If you have a newer card, you may need to perform some updates. Download Litecoin BAMT here [No longer available], and use Win32 Disk Imager to burn it onto a 2 GB USB flash drive. 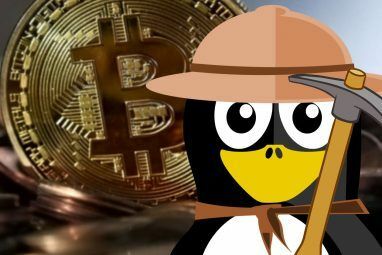 Boot from it, and presto – you’re mining. Unfortunately, you’re mining for someone else since you haven’t set it up with your own addresses yet. Do that now. Note: If you’re planning on only using LTC Rabbit, they have their own customised version of BAMT which you might want to look into – the rest of these instructions should still apply. The default password is “live”. Note the number you find next to the CGMiner process. “Attach” to that screen with the command (replacing 8213 with the number your screen output reported). From there, you can enter interactive mode, or just keep an eye on your card. The interactive text menu allows you to change settings without permanently adjusting the config file. For exactly, to push the GPU memory clock to 1300, you would press G -> C -> M -> 1300 -> Enter. Before you do anything else, open the cgminer.conf file for editing. Right now it has someone else’s mining pool details in there, so you’ll need to change that as soon as possible and restart. 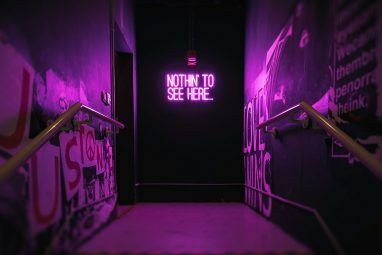 Note that the user entry is a concatenation of your username on that mining pool, a period, and the worker name; the password is usually just x – don’t enter your actual mining pool password – this is just for the worker. If you’ve only joined one pool, delete the details for the additional one, and remove the comma that’s currently separating the two. At some point, you’ll want to join an additional pool as a failover in case the first one is down or does’t have work units available. This file is JSON format, so each property and value must be surrounded by double quotes, and a single colon (:) separates the “property”:”value”. Between property value pairs, you need a comma. Intensity is a basic measure of how hard to work the graphics card, from 0-20. The faster you work it, the hotter it will get. You can keep the temperature constant by setting auto-fan to true and defining a temp-target (a target temperature to maintain). When it goes past this, you’ll hear the fans whack into full blow. Keep the GPU engine clock lower than normal, and keep the memory clock as high as possible (whilst still being stable) – you’ll need to experiment with your graphics card to find what works best. Don’t run at 90 Celsius the whole time unless you want to significantly reduce the life of your card. You should have no trouble finding a suitable configuration for your graphics card, so a quick search on Google will return lots of possibilities to try. Here’s a sample one for R9 series cards. Setting up multiple cards is more difficult, but not impossible. At some point you’ll want to be paid, and for that you’ll need a wallet to “receive” the payments. Your wallet is an application which keeps updated with the network, synchronising transactions. Since your mining machine may be regularly upgrade, reformatted, or otherwise messed around with, it’s a good idea to download the wallet to a more reliable machine that you keep backed up. Head over to litecoin.org and download one suitable for your OS. Alternatively, you can store your currencies in an online currency exchange wallet such as BTCe. The first few hours your wallet will be out of sync, meaning it’s still catching up on all the previous transactions. You can check the Help -> Debug window menu to see the block chain information. When the “Last block time” is roughly the current date, you’ll be in sync again. While out of sync, none of your transactions will show correctly, so if you’ve transferred some in already you’ll need to wait. Cryptocurrency theft has made malware and hacking even more viable than ever – now there’s actual money sitting on your computer, and not just personal information. In some cases, people have lost thousands of coins. For this reason, you’ll want to encrypt your wallet from Settings -> Encrypt Wallet. Absolutely don’t forget your passphrase, obviously – that would be like losing your real life wallet with cash in it. I’m probably not going to make a huge amount of money mining Litecoins; but my ageing GeForce 7800GT was due an upgrade anyway to get ready for the VR revolution 5 Signs The Oculus Rift is Going To Be A Storming Success 5 Signs The Oculus Rift is Going To Be A Storming Success Oculus Rift is going to change gaming, forever - the hype hasn't just fizzled it, it's been sustained for the past year and only growing. The age of VR is now upon us; immersive experiences... Read More . Did you take Kannon’s advice back in July? Are you still skeptical of cryptocurrencies, or are you ready to have a go for yourself? Well thats because you're the only person in the world who can afford a $3700 gfx card. I really wish websites would stop giving free advertising to the scam that is digital currency like Bitcoin, Litecoin and the like. I hope you've used your real email address, but please - do explain *why* you think BitCoin is a scam. Compared to say, your dollar currency (sorry for assuming you're american) - which is just printed pieces of paper, not backed by gold, which can be arbitrarily printed at any time. Anything can be a viable currency if people believe it has a value - currency is a collective illusion. FYI, there are no "original companies", though there is one person who created bitcoin that has profited wildly. Other than that, most of the new coins were announced on a forum with no pre-mine, so everyone had a fair chance at "creating" them. Your only valid point is the power companies. Also, I have a real job, thanks. Dogecoin - I originally read that as Dodge Coin. You can imagine my skepticism. But why are you interested in Dogecoin? Besides the fact that dogs are awesome. I'm not sure how it differentiates itself from the alternatives. Remember your interview with John (I think) from Bitcoin Friday? He mentioned that the only cryptocurrencies worth investing in are those that offer something that distinguishes them from Bitcoin. He meant that as a depository of value Bitcoin is king, because it's the most well established. But in terms of offering ACTUAL value the best had to actually do something unique. He was specifically talking about Crypto like Namecoin, Primecoin (I think that does something) and Devcoin. I'm going to dump my shares of Feather and Lite and try something actually useful for a change. And write about it! I'll also likely write opinion pieces as to why. But basically John was totally right. We're throwing away GPU cycles and power. Why such waste? 1. Bitcoins were pre-mined, which means someone is unfairly sitting on billions of dollar worth. New coins aren't pre-mined, so everyone gets a fair chance. 2. Bitcoins are so inflated that you have to start trading in micro-bitcoins. That's just boring, frankly. I can have 18,000 dogecoins that are worth like $10 at the moment, but that's a whole lot more useful to just throw around than transacting in thousandths(?sp?) of a coin. As long as I can trade the coin, and it has a value on an exchange, I'm not sure why thats a waste. I do hope in the end that we settle on only a few currencies so the prices can stablisise - but then how many "real" currencies are there in the world? Do they not co-exist peacefully? Anything which takes control away from our corrupt and worthless governments is a good thing! Hi James! Very nice and informative article. I just want to know - Is it still possible to mine Bitcoins on a regular PC (Core i7, AMD GPU)? Which other cryptocurrencies are worth mining according to you? Because other than Bitcoin there are many like- LiteCoin, FeatherCoin, DoggeCoins etc. Hey James! But I have seen many people mining Bitcoins from their PC. Maybe I am totally wrong but I doubt after reading this: http://techcrunch.com/2013/04/08/how-to-mine-bitcoins/ and this one also: http://startbitcoin.com/. Which cryptocurrency you are mining right now? Is it a good practice to start mining cryptocurrencies because it sounds easy (standing far away). Yes, you're wrong, but let me clarify why: it is technically possible to set your computer to mine bitcoins - but you would pay more for electricity than you would gain in bitcoins due to the difficulty increases. It is so inefficient that you would simply be throwing away cash - real cash, not virtual stuff. Right now I've joined an auto-pool which switches the currency automatically based on profitability, so I'm not mining any specific coin. It automatically trades and sends me bitcoins. Hey James! That's really good that you have joined Auto Pools. Can you please list some of them. I have seen many by searching on Google. But they don't seems legit. Can you list those ones, which you are using? Thanks! Using middlecoin.com, seems legit but haven't had a payout yet since I only started yesterday. I was playing with hashco.ws, but was getting a reject rate of 50% for some reason. I have a limited data plan 4Glte, 20Gb, because I live just a few miles from town. (technically rural) Can someone tell me how much data this would use over my ISP? Also, I have a XFX Radeon 5870 GPU and Intel Core2 Duo 3.3Ghz. It looks like that would work as far as processing would go. From what I've researched so far. Mining doesn't sound like it'd pay off vs energy and equipment. I like the article in at least it got me to research despite what I've read from some others. This is new to me. Some estimates say 2mb/hour, some say 300mb/month - for mining, that is. Best thing to do would be to measure using your system monitor. If you run a local client wallet though, that will take a few gigabytes/month, so I'd advise you to use an online wallet and not a local one. Great writeup. I still have a feeling in my gut that Bitcoin/Litecoin/etc. will burst soon, which is keeping me from being too invested in that whole economy. Well, I thought that 3 years ago. Fool me once, shame on you! Fool me twice, well ... you can't fool me twice! @ Darth, you can do that as well just by registering for a litecoin wallet and find a site where you can purchase litecoins. One thing this article doesn't mention is Nvidia cards, which I'd like to help anyone who has one here now. First, Nvidia cards are slower than ATI cards, so the problems are that even if you have one, you can still mine Litecoins if you so choose, but be prepared for slower returns because the Nvidia cards process the complex calculations slower. Why? Because ATI cards are built for processing better than Nvidia. Now, this might change in the future, but for now, ATI is the way to go if you are trying to get a card for mining independently. But what if you're already stuck with a high-end Nvidia card or even a low one and you want to mine with it? The costs aren't going to look good, unless you get electricity for free then you can still mine with it. How? First get that Litecoin wallet. Next, if possible, make sure that you have the latest CUDA-Miner, which should be from 12-10-2013 version. Download it, unzip it, and prep it. Now...if it works, you should be ok. And I'll get into more details on what to do after it works. If it doesn't however, make sure your setting are correct. Also make sure you have downloaded the latest CUDA drivers from Nvidia, as that will help. AND make sure you've registered for the mining pool site you want to work with, as you can't mine without it. I recommend WeMineLTC.com, as it's been solidly producing for me, but ultimately you can find your own site or stick with my suggestion. Some sites have better active setups suggestions to help you get set up. Now, let's say you did all of this, you've got your LiteCoin Wallet setup, your miner setup at the mining pool where you registered, you've put in your basic mining info into the CUDA miner, and you can see you are accepting files and see your progress is working and you are accumulating LiteCoin on the mining website. The next step is to watch what your setup is on CUDA miner. Let's take an example. Say you start up and double click your .BAT file to start, and you see the startup. For example I have a GTX 580 Nvidia card that's overclocked with 1.5 Ghz of Ram on it. When the CUDA miner starts up, it set up and auto-tuned itself to an F32x8 setting. Record that setting for later. Now...in the README.txt file in CUDAminer, it has what are called startup flags, things you can set the .BAT file you create to start up with so it BYPASSES the autotune startup and you can set the Intensity, the launch configurations so you can get the maximum potential out of the card you have so that you can mine effectively. I recommend reading that README.txt file, it will help explain things a bit more. Another thing, at this time I am typing this, there are two different version of CUDA miner for Windows, the 32-bit version (marked x64) and the 64-bit version (marked x86). Now you would THINK that the 64 bit version is the one you want to run, right? WRONG. At this time for some strange reason, running the 32-bit version is better and gives you a 10 percent increase in accepting hashrates, and we want to get the best hashrate possible out of our mining. So use the 32-bit version for now. Eventually CUDA miner will hopefully increase better down the road with 64-bit but for now, run your .BAT file in the 32-bit version. Finally, I know I can't put every single tip down here to help you out, but this is just an additional guide to help you mine LiteCoins with an Nvidia card. I can't put down everything. Other suggestions, check out YouTube and do a search with "How to Mine with CUDAminer" and you'll find some excellent videos to help you get started and explain things better for you than I could here. My thanks and good luck to you in your mining! No no, you need to check the actual power consumption - 750W is the maximum rated, but your actual usage will be much lower as you could fit maybe 2 on that PSU. Google tells me that card under will be about 300W. That said, LiteCoins are getting unprofitable very quickly - I've switched over to dogecoins for the time being! Much value, so rich. When I was checking it out I put in 300W too, just to see what it would get, and the amount of money it would make wasn't really worth considering. Plus I couldn't run this as a miner 24/7 because it's the machine I use for work / games. why not just buy LC and sell them later? seems easier, and more profitable in the long run. Where's the fun in that? I might just as well trade forex, or stocks. Mining is a hobby, for most people. It's still cheaper to mine in terms of energy costs compared to what you can sell the things for. Great article James! And thank you for the nod. I didn't know about BAMP for Litecoin. I had been attempting to optimize the CGminer script for my system, but virtually no one else is running dual graphics APUs, despite the potential for a low-cost mining build. I'm trying to find whether or not BAMP will work for Feathercoin. I think it should, given it uses the same hash function. Holy crap though. You are running over 850 kH/s?!?! Those new breed of AMD GPUs are really something else in terms of wattage/hashrate. I ended up switching over to mining Feathercoin because of the MUCH lower difficulty levels. It ended up being a much better bet for me than even Litecoin as it produced up to 40x the original value. Unfortunately, as with all Cryptocoins, the price collapsed after China announced its latest policy. But as far as mining goes, Feathercoin was pretty darn productive.